Standards serve a very important purpose and are a part of our daily lives − in the lab where our samples are tested, in the equipment that we use at the gym, to the way we work and perform our jobs. We need them to help keep us safe, to make sure that there is consistency in how products are made, tested, and used by all, and sometimes the government may mandate compliance with a standard in lieu of government guidance. Standards benefit everyone too—industry, government, consumers, young professionals, and students. A standard is an agreed-upon way of doing something. In this case, it is a written document that tells you how to do, make, test, or design something. A standard can set specific guidelines for the design, operation, manufacture, and use of is the product being produced. There are standards to protect human health, safety, and the environment, and standards to ensure that different products work compatibly. PDA is recognized by industry professionals and regulators around the world who rely on PDA’s peer-reviewed technical documents for expert guidance and opinions on important scientific and regulatory topics. Therefore, the logical and natural progression was for PDA to expand this expertise into the world of creating standards that provide guidance to the industry on best practices for drug manufacturing for patient use. What does it Mean to be a Standards Developer? SDO stands for, Standards Developing/Development Organization. Becoming an accredited Standards Developer means that the process and steps performed by PDA meet the guidelines set forth by the American National Standards Institute (ANSI) in the ANSI Essential Requirements: Due Process Requirements for American National Standards (https://www.ansi.org/essentialrequirements). The key elements include openness, consensus vote, due process, lack of dominance, balance, public review/consideration of views and objections, an appeals process, and compliance with the ANS policies and administrative procedures. The standard development process and structure operates similar to PDA’s volunteer technical report teams and task forces groups. 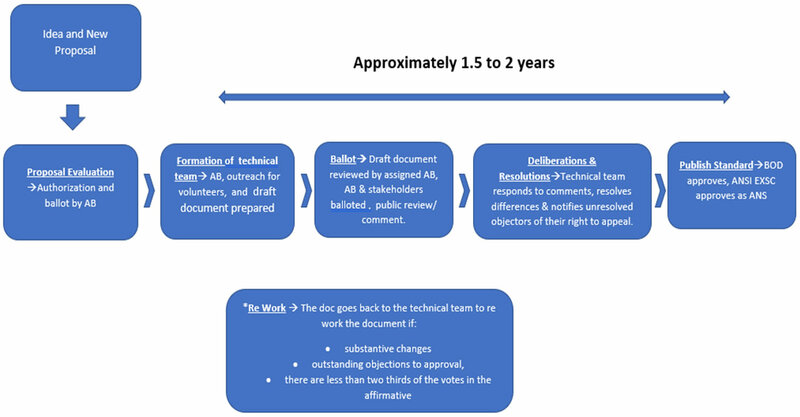 An idea for a technical document is put forth for development, and an Advisory Board manages the technical team and task force, as well as provide oversight of the team and monitors their progress, supervises peer reviews, and ultimately votes to approve or disapprove a technical report for publication review. In standards development, a need is identified, and a written proposal submitted. That proposal is vetted by the PDA staff and balloted by an advisory board. A volunteer group of experts come together to develop a best practices document based on a process where the input of everyone is carefully considered and a document is crafted that best meets the needs of the group and or the ‘stakeholders’ - those individuals or groups with a concern or interest in the outcome. The volunteer experts, together with the public review and commenting period, create what is known as a Consensus body that provides oversight, guidance, and approves the content of a standard, before it is presented to the Board of Directors, and eventually presented to the ANSI Executive Standards Council (ExSC) to become and American National Standard (ANS). When completed, PDA standards will be available for purchase on the PDA website. ANSI stands for the American National Standards Institute. Founded in 1918, ANSI is a private, non-profit 501(c)(3) organization whose mission is “to enhance both the global competitiveness of U.S. business and the U.S. quality of life by promoting and facilitating voluntary consensus standards and conformity assessment systems and safeguarding their integrity.” Simply put, ANSI wants the U.S. to make doing business here and overseas easier by getting everyone on the same page and operating using the same rules. This in turn will make doing business seamless, and products safer, whether the items were purchased in India or here in the U.S. The way to do this is by developing and using standards that everyone can have a say on, can agree on, and can use…a ‘power to the people’ approach! ANSI is not a government agency, nor does it develop standards. However, ANSI does make it easier to come to an agreement by accrediting the procedures used by standards developers, and by making sure that these procedures allow for openness, balance, consensus, and due process. These principles mean: anyone who wants to contribute can, no one group can monopolize or skew procedures in its favor, and, should someone feel that he or she wasn’t given proper consideration, procedures are in place to review and evaluate the situation to ensure the process was conducted fairly and equally. How is ANSI related to ISO? Another advantage in becoming an ANSI-accredited Standards Developer and having approved standards through ANSI is that the voluntary consensus standards are produced in a process consistent with that of the International Organization for Standardization (ISO). ANSI is the sole U.S. representative of ISO, and a founding member; hence, ANSI plays an active role in ISO governance. ANSI has also been a strong and active leader in ISO’s sister organization, the International Electrotechnical Commission (IEC), as well as other international and regional standardization bodies. By being accredited through ANSI, PDA has the opportunity to also participate in ISO standards development. Want to Be a Part of Standards Development Process and Know More? Membership in any PDA standards development activity is open to everyone, particularly those that may be interested or involved in production, application, and regulation of products related to the pharmaceutical, biopharmaceutical, scientific, and regulatory community. You can learn more by contacting standards@pda.organd make sure to visit the Frequently Asked Questions page. BSR/PDA Standard 01-201x, Enhanced Purchasing Controls to Support the Bio-Pharmaceutical, Pharmaceutical, Medical Devices and Combination Products Industries (new standard). This proposed American National Standard (ANS) was put forward by Mr. Martin Van Trieste, Immediate Past Chair at PDA. The proposed standard is intended to address the challenges organizations face when purchasing, procuring, or referencing where specific material or ingredient came from. This proposal also provides steps to make the responsible party more effective in preventing substandard or adulterated materials from entering the market and potentially harming patients. BSR/PDA Standard 02-201x, Cryopreservation of Cells for Use in Cell Therapies and Regenerative Medicine Manufacturing (new standard): An Introduction and Best Practices Approach on how to prepare, cryopreserve, and recover cells, cell lines, and tissue for use in cell therapies and regenerative medicine manufacturing. This proposed American National Standard (ANS) was presented by Dr. Brian Hawkins, Scientific Applications Director at BioLife Solutions, Inc. The proposed standard is intended to: address the challenges associated with maintaining viable recovery and functionality of cellular therapies and tissue products; discuss the benefits and considerations of low-temperature biopreservation; outline Biopreservation Best Practices for users; and propose considerations for incorporating Biopreservation Best Practices into a GMP cell therapy product. Become a part of the PDA standards development process …The Parenteral Drug Association: Connecting People, Science, and Regulation® through Standards!